If you are in the market for a high-end SUV the number of choices has grown significantly the last few years even with the addition of some big-name ultra-luxury off roaders entries like Bentley and Rolls Royce. 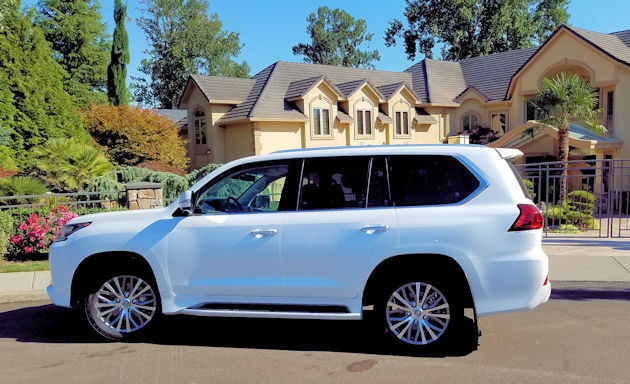 One of the stalwarts at the lower level (under $100,000) of the expensive luxury SUV offerings has been the Lexus LX 570. 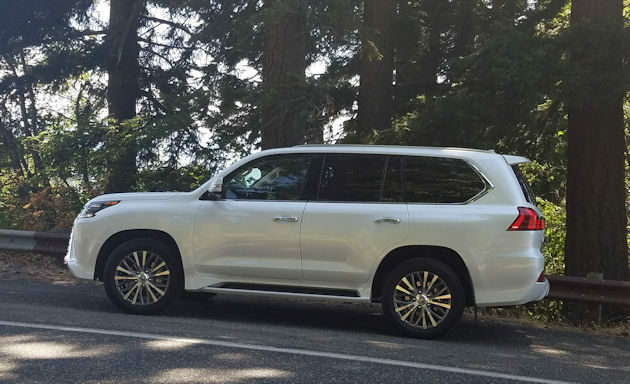 As a gussied-up version of the Toyota?s legendary Land Cruiser, the Lexus LX 570 inherits the impressive off-road capabilities of the Land Cruiser, but then the Lexus designers have taken over and given it superb luxury treatment. Designers and engineers have gone the extra mile giving their cars an elegant, comfortable, quality feel, something we call the ?Lexus Treatment.? We have on occasion referred to some Lexus vehicles as being close to perfect, but we?ve also often qualified that statement with the caveat that the quest for refinement sometimes leaves the vehicles falling short of personality or being somewhat bland. However, that seems to be changing, as some of our recent Lexus drives have revealed more driving excitement and stretching of the styling envelope, but never at the expense of luxury. Like the entire Lexus vehicle lineup, the LX 570 has an elegant exterior with the family hour glass grille. 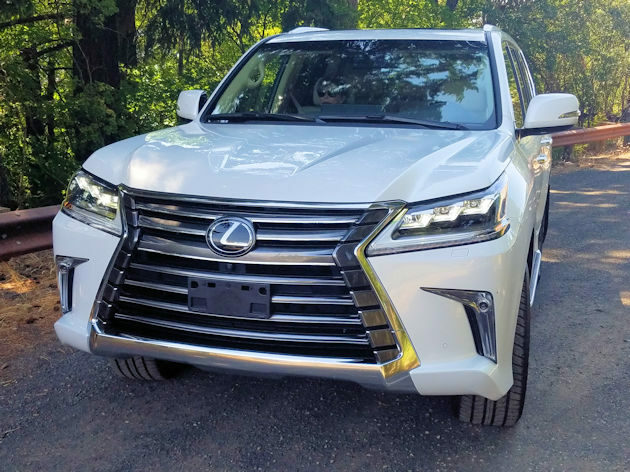 While we?re not fans of the massive Lexus grilles, they are distinctive and quickly identify the brand, not unlike the family look we see on some German brands. This distinctive look on this full-size SUV also comes with standard LED lighting front and rear and with LED daytime running lights. 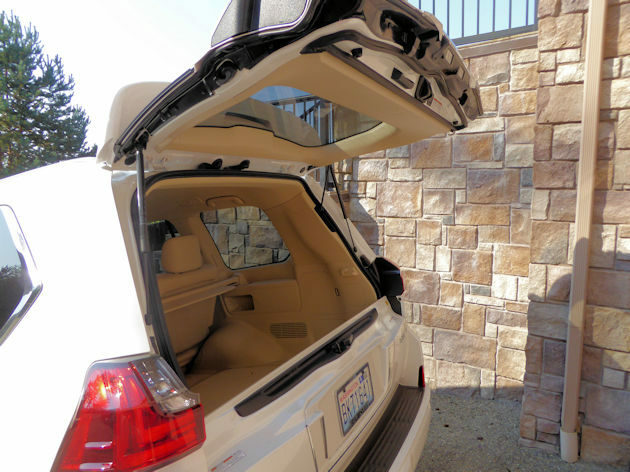 The LX has a high-quality fit and finish and good overall look, but there is little to set it apart from the crowd of full-size luxury SUVs. 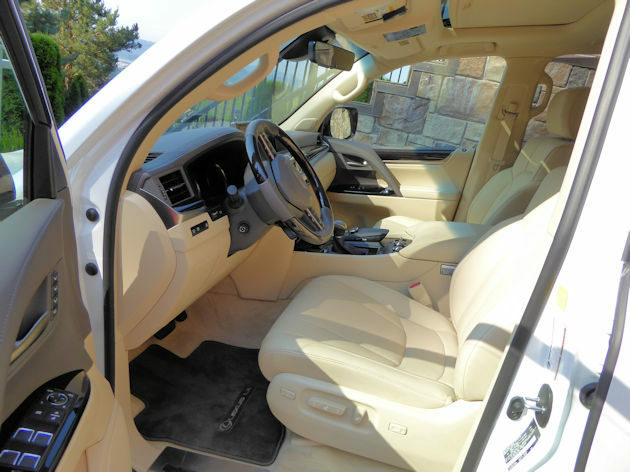 Where the luxury stands out the most is in the posh interior treatment. It?s filled with soft warm leathers, real wood trim, large quality switchgear all wrapped in a quiet cabin with a very elegant look. 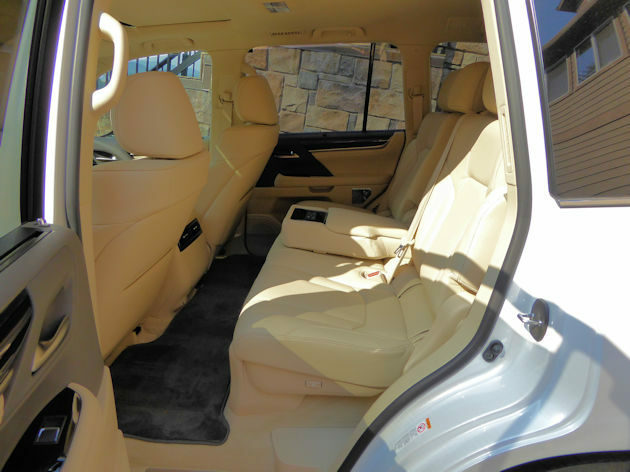 The interior is comfortable, and occupants feel the luxury both in the surroundings and in the ride quality. Based on the underpinnings of the Land Cruiser, the LX 570 rides on a rigid body-on-frame structure with coil springs in the front with a double wishbone suspension and a four-link coil spring lateral rod-type in the rear. The suspension is an Electro-hydraulic system with four-wheel Active Height Control suspension that can lower the chassis by nearly three inches for easier entry and exit but it raises to normal drive height as the vehicle accelerates. The system also has automatic load leveling so strapping on a trailer won?t point the headlights at the sky after dark. The system, when combined with the power V8 engine provides up to 7,000 pounds of maximum towing capability. With its 20-inch alloy wheel the LX 570 has 8.9 inches of ground clearance to help keep it from dragging bottom when off-road. 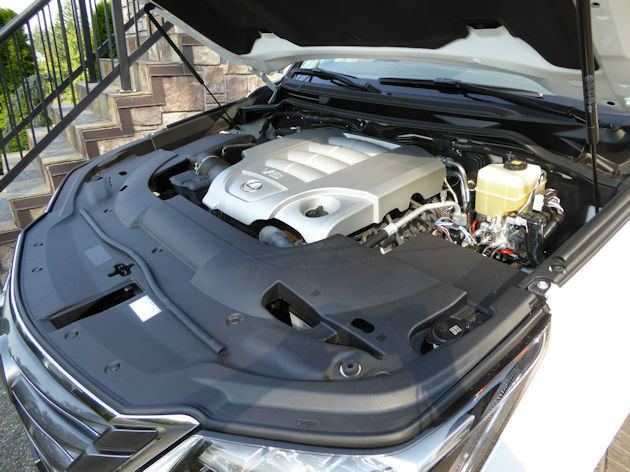 There is a 383-hp 5.7-liter V8 engine under the hood backed by an eight-speed automatic transmission propelling the 5,800-pound full-size SUV. While we certainly enjoyed the plush ride and opulent Lexus interior, it?s nice to know that the LX 570 can handle the more difficult off-road challenges should the need or desire arise. It utilizes a four-wheel Active Traction Control system to control wheel slip and a Multi-Terrain Select system. The driver simply selects the appropriate mode: Rock, Rock and Dirt, Mogul, Loose Rock, or Mud and Sand. The system automatically adjusts the drive train to best setting for a condition. The LX 570 employs a Torsen? limited-slip locking center differential with full-time four-wheel drive, splitting torque 40:60 under normal driving conditions. The driver can lock the center differential when the going gets tough, plus it has a four-wheel Active Traction Control system helps to control wheel slip. When the current generation was introduced with Crawl Control seven or eight years ago, Bill got an eye-opening demonstration of the Crawl Control system with Turn Assist, Hill-start Assist Control and Variable Gear Ratio Steering when the systems were first introduced. At that introduction he drove down a very steep slide area with the vehicle maintaining perfect control in what seemed like impossible conditions ? a feat he?ll never forget. The Crawl Control works like a cruise control system providing throttle and braking inputs for less experienced off-road drivers: an interior lever allows the driver to change speeds to meet comfort levels. By controlling descent automatically, it allows the driver to concentrate on steering. Accelerating from 0 to 60 mph takes 7.3 seconds and, on a track, or other closed setting the LX 570 is capable of an electronically limited top speed of 137 mph. The EPA lists fuel economy at 13 mpg city, 18 mpg highway and 15 mpg combined. We averaged 14.0 mpg according to the trip computer during our week of mixed highway and city driving. 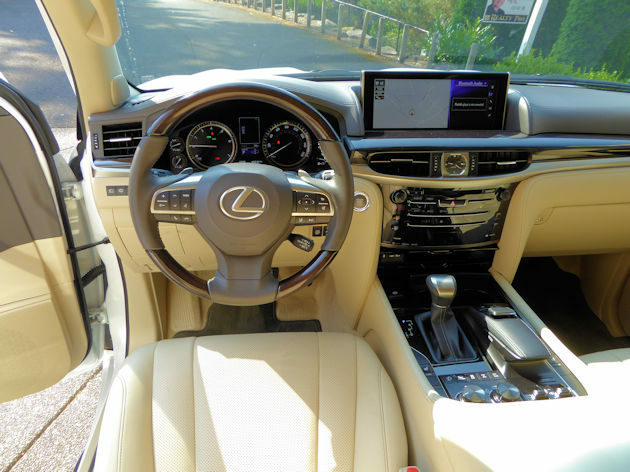 On pavement, the big Lexus is fully equipped with all the bells and whistles as standard equipment that includes features, we think are necessities like active cruise control, blind spot monitoring, rain-sensing wipers, navigation, and an extensive infotainment system. Other than a choice of colors and a couple accessories, the Lexus LX 570 is only available in two versions ? two row or three row. The sizes are the same, it?s just that the two row seats five and the three rows can hold eight passengers in a roomy cabin. It?s a choice of more room for people or cargo. The Lexus LX 570 pricing starts at $87,125, including the destination charge, for the two-row. The three-row is $5,000 more. 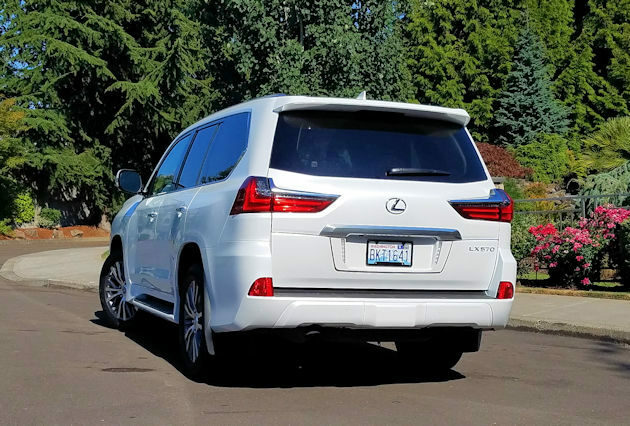 The Lexus LX 570 is luxurious, well-built and a good performer, but it?s getting dated. There are some new competitors in the under $100,000 category of luxury SUVs that are fresh, and frankly more exciting.